A soil temperature control system was designed for sapling study in alpine region and tested in summer, 2009. The system consisted of a power switch, voltage regulator, microcomputer timer, safety relays, temperature control device, temperature sensors, heating cables, fireproofing plastic pipes (PVC), 108 heavy-duty plastic containers and seedlings. The heating cables were held in six 2-layer PVC frames with 25 cm wide, 320 cm long and 25 cm high and three 1-layer frames with 25 cm wide and 320 cm long for 15°C soil temperature treatment, half of the 2-layer frames were used for 20°C and 25°C soil temperature treatments, respectively. Each of the frames was installed at each of ditches with 30 cm wide, 330 cm long and 30 cm deep in size. 12 seedling containers with 20 cm top diameter, 18cm bottom diameter and 25 cm high were homogenously placed at each of the ditches, and spaces between the containers were filled with natural soil. The system was economic, and could increase soil temperatures obviously and uniformly, the maximal and minimal standard errors of soil temperatures were ±0.28 and ±0.05°C at 10cm depth in the containers within each of all the ditches. 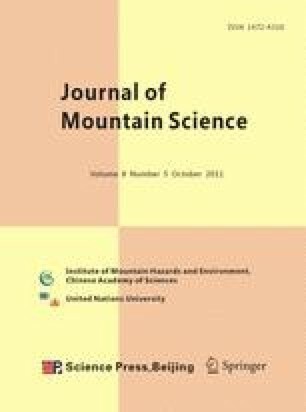 In the system, aboveground environment was natural, diurnal and monthly soil temperatures varied with changing air temperature, the research results may be better to know the ecophysiological and growth responses of alpine saplings/seedlings to soil warming than that in greenhouse, laboratory, infrared heat lamp and open top chamber.